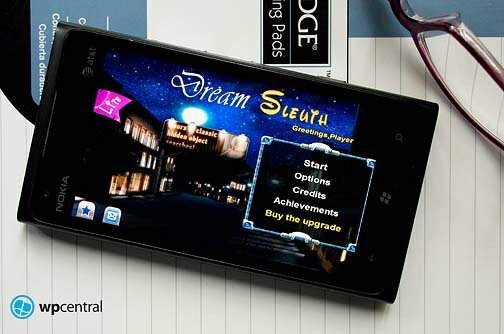 Dream Sleuth isn't your run of the mill Windows Phone game. It's part I SPY, part puzzle game, and party mystery novel. You play the role of Catherine, who must figure out all the clues to a mystery through her dreams. Dream Sleuth start out a little on the slow side but once you get into the game portion of the adventure, it picks up a little steam. Dream Sleuth's main menu covers options to play the game, access the settings/options (sound/music levels), view the developer's credits and view your gaming achievements. The story line starts with you arriving at your Grandmother's house where you discover a girl has been kidnapped. After a little dialog with Grandma, you head to bed and dream of seeing the girl and have to solve a few puzzles to discover the girls identity. From there you move from chapter to chapter, discovering more clues and pieces to the puzzle. Eventually solving the mystery of the kidnapped girl. Dream Sleuth includes eighteen chapters where you'll be called upon to find clues, solve puzzles and tackle mini-games. All in an effort to unlock more details of the mystery and earn all eighteen achievements. You can skip the dialog through the menu button on the gaming screens but might miss vital information on solving the challenges of each chapter. The dialog can be a little drawn out and if you're looking for a fast paced, action game Dream Sleuth may not be that appealing. On the other hand, the puzzles and mini-games are challenging enough to keep you interested and the story line isn't too bad. If you like mystery games, Dream Sleuth might be worth a try. There is a free trial version available with the full version of Dream Sleuth running $2.99. You can find it all here at the Windows Phone Marketplace.